23-year old forward Francisca Rojas (176-F-93) put on an extraordinary performance in the last round for Brisas and receives a Latinbasket.com Player of the Week award for round 8. She had a double-double of 31 points and 11 rebounds, while her team beat Sergio Ceppi (#6, 2-6) 79-72. Brisas maintains the 5th position in Chilean Liga Femenina. Brisas is a typical solid league team placed somewhere in the middle or a little bit lower in the standings. They need more victories to improve their 4-4 record. In the team's last game Rojas had a remarkable 55.0% from 2-point range. She turned to be Brisas' top player in her first season with the team. Boston College graduate has very impressive stats this year. 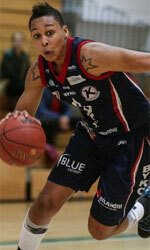 Rojas is league's best scorer averaging so far 22.9ppg. Rojas is in league's top in rebounds (9th best: 8.1rpg). Second best performed player last round was Arlenys Gonzalez (185-C-87) of Boston College. She is Cuba center in her first season at Boston College. In the last game Gonzalez recorded impressive double-double of 27 points and 14 rebounds. Bad luck as Boston College lost that game 68-74 to league's leader Sportiva Ita. (#1, 7-0). It was definitely game of the week between two contenders to the title. Boston College still maintains its place in the top 4 of the standings, even despite this loss. Her team's 4-3 record is not bad at all. Gonzalez is a newcomer at Boston College and quickly became one of team's most reliable players. She belongs to the best scorers in the league with 20.4ppg (#5). She also registered 12.4 boards per game. Third place about best performers goes to Dominique Del Canto of league's second-best Univ.de Chile. Del Canto scored 21 points and passed eight assists. She was a key player of Univ.de Chile, leading her team to a 92-55 easy win against the lower-ranked Univ.de Los Lagos (#8, 1-7). Univ.de Chile is closer and closer to top of the standings. They will still need more victories. But 7-1 record is not that bad... Del Canto has a great season in Chile. After only 8 games, she made it on the list of the league's leaders in assists with 5.8apg (best passer). She also has 3.5spg and FGP: 64.4%.